PD-MitoQUANT recently appeared in the news stream of HealthEuropa.eu. 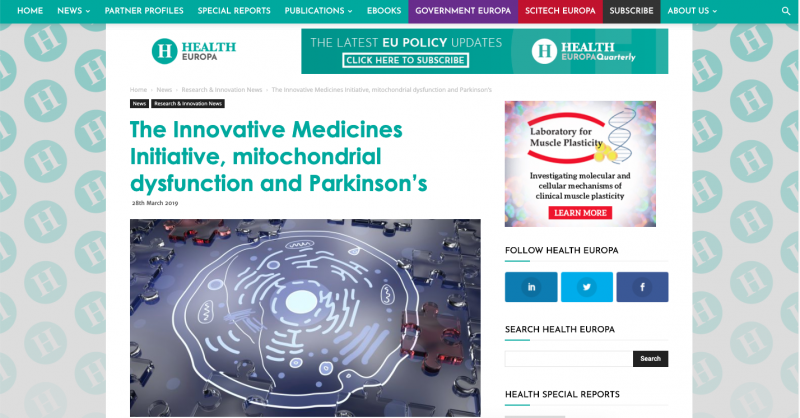 Read the story, “The Innovative Medicines Initiative, mitochondrial dysfunction and Parkinson’s”. Read the story here. Health Europa highlights the latest trends and developments in health and healthcare from across Europe. Their platform is a valuable news source to the health sector, allowing them to discuss research and innovation themes, health policy and new technologies. In addition, the website, HealthEuropa.eu has gained Google News approval. It features news, interviews and insightful commentary from leading figures, keeping readers informed and up to date on all aspects of health and care.